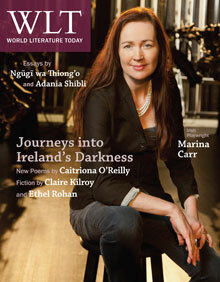 Marina Carr is an influential voice in contemporary drama in Ireland and beyond. Born in 1964, Carr grew up in County Offaly and studied English and philosophy at University College Dublin, where she later focused her graduate studies on the work of Samuel Beckett. To date, Carr has written sixteen plays, and she is now considered—along with Brian Friel—one of Ireland's most important playwrights since Beckett. In 2012, Carr visited WLT and the University of Oklahoma as the 2012 Puterbaugh Fellow.